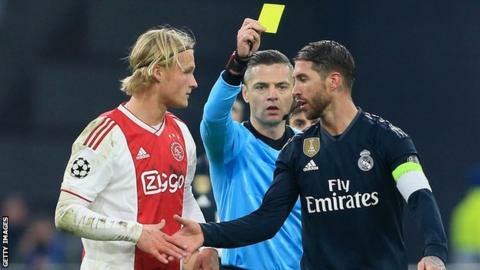 Sergio Ramos has been given a two-game ban by Uefa "for clearly receiving a yellow card on purpose" during Real Madrid's Champions League tie at Ajax. The Spain defender, 32, told reporters afterwards he would "be lying if I said I didn't force [the booking]". Uefa opened an investigation and gave him with an additional one-match ban for obtaining a booking deliberately. Ramos clarified his post-match comments, saying: "I was referring to forcing the foul, a foul that was inevitable. Not to forcing the booking. "It was a very dangerous counter-attack in the 88th minute, with an open match and the tie as well." He added: "That's why I said that I would lie if I said I did not know that I was carrying a penalty, just as I knew that I had no other choice than to make a mistake. And that's what I meant when I said that in football you have to make complicated decisions."